Aspirin works as an excellent exfoliant when applied on skin. Moreover, aspirin facial masks are beneficial for getting rid of acne. 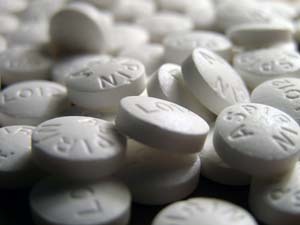 Basically, aspirin is acetylsalicyclic acid, a form of salicylic acid, which in turn, is a beta hydroxy acid (BHA) that helps unclog the pores and stimulate cell renewal. The best way to include this extremely affordable anti-inflammatory medicine in a skin care recipe is to crush three to five plain, uncoated aspirin tablets (you may grind the tablets in a small coffee grinder) and add the resultant powder in the mask to slough off dead skin. Simply applying a paste of aspirin and a little water on a weekly basis can reduce acne considerably. As aspirin is particularly good for oily skin, those with dry or sensitive skin can include moisturizing agents such as organic honey or aloe vera gel in it to avoid dryness. • To clear acne and get soft, glowing skin, put a little water on three to four aspirins to dissolve them and add two drops of honey in it. You may also add a little sweet almond oil, olive oil, or jojoba oil in it. Smear this mixture on your face and neck. Rinse it off after 10-15 minutes. Here’s a video showing how to make a DIY aspirin mask for skin. • You can prepare a homemade facial toner by dissolving eight to ten aspirins in half a cup of distilled water and mixing half a cup of vinegar in it. After applying this recipe, wash your face with lukewarm water followed by a splash of cold water. • Crush about five to ten plain aspirin tablets and mix lime juice, lemon juice, or orange juice in it just enough to form a thick paste. Massage this mixture on your face and wash it off after 5-10 minutes to rejuvenate your skin. Finally, apply a moisturizer. • Regularly applying a combination of four to five crushed aspirin tablets and 1-2 teaspoons of plain yogurt or aloe vera gel can cure acne scars and blemishes. • Take a lemon wedge and put about four to six aspirin tablets on it. Next, add some plain yogurt and a drop of honey in it. Scrub your skin with this simple recipe every few weeks for exfoliation. • Place 10 aspirin tablets in a bowl. Immerse a green tea bag in hot water and put a few drops of this solution on the tablets to dissolve them. Then, add a few drops of organic honey and sweet almond oil in it. Spread it on your face and neck. Finally, rinse it off after 15 minutes. Regular application of this mask helps maintain clear and younger-looking skin. • You can mix a few aspirin tablets in fruit masks like that of pumpkin, papaya, tomato, strawberry, avocado, and so on. You may add milk cream, or a few drops of essential oils as well. While preparing beauty care recipes with aspirin, do not use these tablets in excess, or else it may burn your skin as it can be too strong for the skin. Needless to say, do not use aspirin if it irritates your skin.